The top fitted bedroom furniture brand has scooped an impressive 89% customer score in the results of our first-ever survey of 1,200 fitted bedroom furniture customers. We asked people to rate their experiences of shopping with well-known fitted-furniture companies Hammonds, Sharps and Sliderobes, as well as department store John Lewis and budget option Ikea. We’ve given each company a customer score, based on how satisfied its customers were overall. Plus, we’ve given them individual star ratings for measures including customer service, build quality, durability and value for money. Find out which company came out on top in our guide to fitted bedroom furniture brands. It was a photo finish for the top two brands, which came in with customer scores of 89% and 88%. Both got five stars for customer service and the build quality of their fitted furniture. However, both scored a more average three stars when it came to value for money. One brand scored an impressive five stars on this measure. The lowest-scoring brand overall got a distinctly average three stars for build quality, and only two stars for value for money. Fitted bedroom furniture includes wardrobes and other furniture that’s built into a specific space, often flush against the walls, floor and ceiling. It’s usually made to measure, though some brands – including Ikea – sell off-the-shelf modules that can be incorporated into most standard spaces, but won’t necessarily fit the exact dimensions of your bedroom. If you’d like your fitted furniture to blend seamlessly into an awkward space, such as into a corner or under eaves, you’ll need a bespoke commission. There are a few different options when it comes to buying fitted bedroom furniture. You can use a national brand, an independent company or a local builder or joiner. 24% of the people we spoke to had used a local independent of some sort. The five national companies we’ve reviewed are the ones most commonly used by the Which? members who answered our survey. Hammonds and Sharps were the most popular brands overall, with 16% and 15% using them, respectively. If you decide you’d rather use a local trader, you can find one in your area using Which? Trusted Traders. All our traders have been through rigorous background checks. While some companies are pricier than others, your fitted furniture is likely to be an expensive purchase and will make a big difference to the look of your bedroom, so it’s worth making a carefully considered decision about what you want. 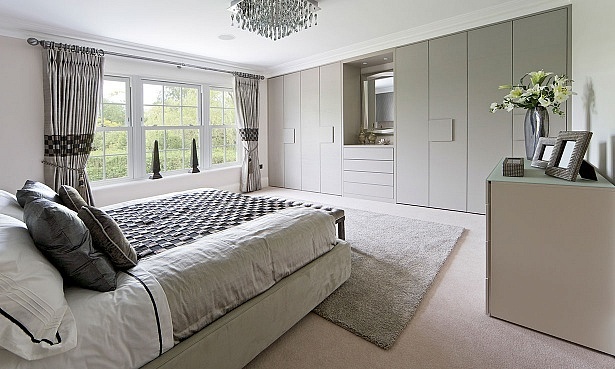 Before you splash out, head to our guide to buying fitted bedroom furniture. It explains what you need to think about before you begin, talks through the process and features tips from other customers, including how to avoid the things they regret about their own purchases. In June 2018, we asked 1,172 Which? members about their experiences with the company from which they had bought their fitted-bedroom furniture. They had to have made their purchase in the previous five years, and we needed at least 30 responses to be able to rate a company. For the durability rating, we asked people who bought their furniture between six to 10 years ago. These star ratings are only for the purchasing process and the quality of the furniture itself, not for the installation process.